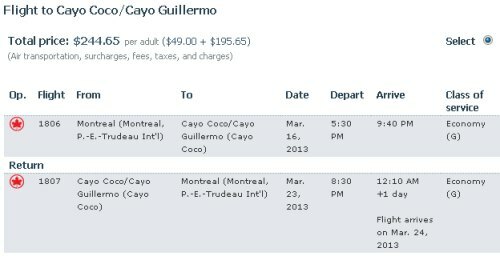 AirCanadaVacations has some seats on a last minute flight from Montreal to Cayo Coco, Cuba available for $244 roundtrip after taxes. 3. Search for a flight from Montreal to Cayo Coco/Cayo Guillermo, Cuba - departing March 16 and returning March 23.
montreal, yul, flight deals, cuba, caribbean, western caribbean, cayo coco, ccc and air canada vacations.